Veggies provides catering support, advice and facilities for indoor gatherings, often hosted at the Sumac Centre and other social centres, or at summer camps, such as those held by Peace News, Earth First, the Animal Rights Coalition and Climate Camps. This advice may also be helpful for the community cooks at the ‘People’s Kitchen help each Saturday at the Sumac Centre. Details of Camps and Gatherings at which Veggies is providing catering support can be found on our events diary. Additional advice (and some the same) can be found in Lou and Shannon’s Kitchen Skillshare (txt file), which we’ll convert for inclusion here in due course. Open Office or word document. Friday Lunch: A selection of Pasties (from Screaming Carrot), mashed spuds, salad. Sun Dinner: Chickpea Curry & Rice. In addition to main meals, Veggies gathering catering includes breakfast with Essential deluxe muesli, Dove’s Farm gluten free cornflakes, peanut butter, fruit spreads, yeast extract, wholemeal bread, sunflower spread; and teas, coffees and juice throughout the day. Where possible we source local and wholesome ingredients, organic where available. See http://www.veggies.org.uk/sales/organic.htm. Replace the town name required – the listing radiates from the selected town, by similar postcodes). Note that, whilst bakers might not use animal ingredients in their bread, they may bake in the same ovens as, for example, sausage rolls or meat pies, with possible risk of cross-contamination by crumbs or steam. For the 2013 British Juggling Convention, we used Cooplands in Pickering, N/Yorks. For the 2013 Peace News Camp we found a good local craft bakery, Roystons in Long Stratton, 10 miles from Diss. The village had 2 well stocked Co-operative stores too. Although not organic, L&M on Berridge Road, Forest Fields, Nottingham (0115 942 0008) are our regular supplier of quality fresh vegetables and at 0.2 miles couldn’t be much more local. Ecoworks veg boxes are grown by local people in Nottingham, the majority of it on their gardens in St. Anns. 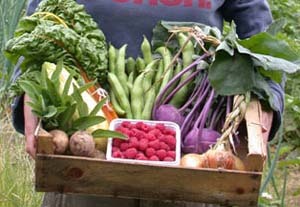 Eden Farms organic vegetable home delivery service to Nottingham, Lincoln, Loughborough and Leicester. In the North, Goosemoor Organics near Wetherby, North Yorkshire, provided great service and a wide range of seasonal veg for the 2006 Climate Camp and the 2011 AR Spring Gathering in Bradford. 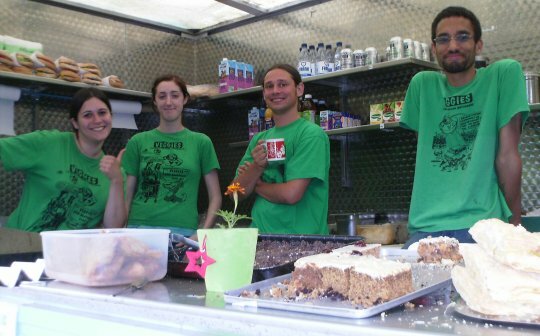 For the East of England & London try Norfolk based Eostre Organics Ltd, 01953 456294 (who supplied the July’08 Climate Caravan). Best of all, to avoid animal products like blood, bonemeal or manure on your food check the Vegan Organic Network list of Stockfree Organic Certified Growers, including Berkshire, Lancashire, N.Yorks, Cheshire & Flintshire (Wales). Big Barn is a searchable website or organic and local foods. http://www.farmaround.co.uk/. Vegetarian Box Scheme suppliers in London & North of England. http://www.abelandcole.co.uk. Also sells meat & dairy. In the West Country we use Essential Trading, and oop North, Suma Wholefoods. Search for calor gas suppliers via Calor Gas website. 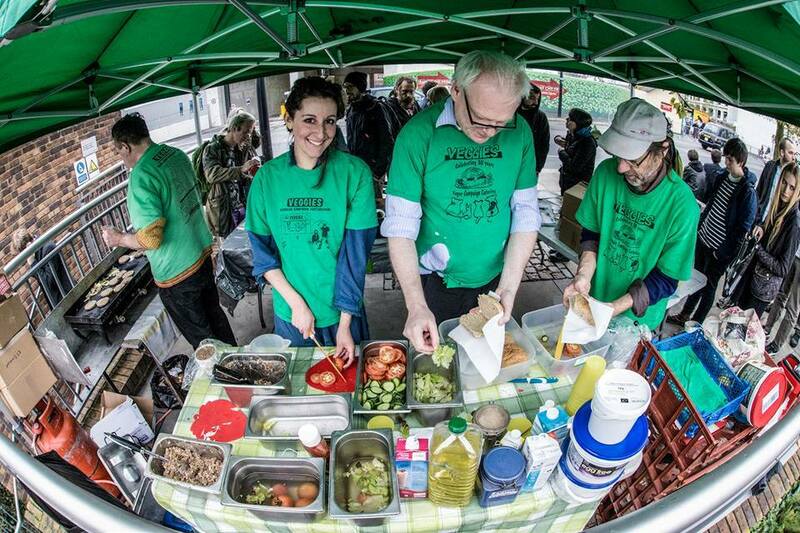 If you are setting up a kitchen at a camp or a neighbourhood at a campaign gathering you may find useful the Neighbourhood briefing prepared for the 2007 Camp for Climate Action: checklist to print (RTF). Additional advice (and some the same) can be found in Lou and Shannon’s Kitchen Skillshare (TXT). Use a pot big enough for about 0.4ltr per person, or 0.5 ltr for soup as a meal. The volume of a pot is approximately depth x radius squared x 3 (roughly ‘pi’). Measure in centimetres and divide by 1000 for litres. 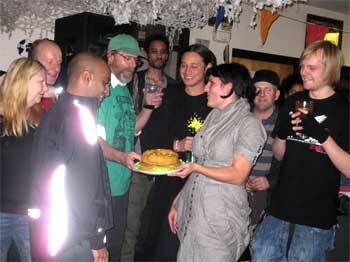 eg a medium pot 25cm across by 20cm deep is almost 10ltr, enough for 20 – 25 people. It is worth noting that on a typical ring burner or water boiler 5lt water from cold takes about 16mins to boil, whilst 5ltrs added to an already boiling boiler drops it’s temperature to 83 degrees and takes about 12 minutes to get back to boiling. The best temperature to brew coffee is 88-93 degrees. Just a few notes on bread here. You might be wanting to put out bread with breakfast, and/or with soups, or for sandwiches. Find a nice bakery that does organic bread if that’s what you’d like, and try and get the largest loaves you can find (usually 800g). If you can get them sliced and bagged up, there are advantages, but also some more waste. You might want to ask for half of the bread to be bagged up so it keeps better. Fresh bread will be okay, stored in bakers’ trays in a not too hot place for a few days (possibly up to 3), but if you’re cooking over nearly a week, it’s best to try and arrange two or three deliveries of bread, unless you’ve got some means of freezing large quantities of bread. Count out the number of plates required. Divide into two piles. When the first half are served judge whether you are more or less than half way through the available food. Adjust portions accordingly. Recipes for gatherings: Meals for 50-100 in a field! From the Anarchist Teapot Guide to Mass Catering (1.2mb pdf file) which is a fantastic guide on how to cook for loads of people, with tips, guides for how much for each person, and recipes. Tomato puree: 35x 200g double concentrate tubes for a sauce for 200 – or, large size catering tins (usually 900g) – 4x for a sauce for 100. A bit less if you’re using chopped tomatoes too. Based on advice for catering at events and gatherings from Veggies archive.